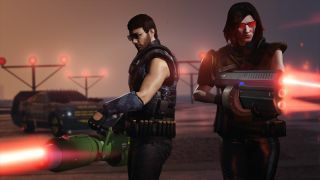 Christmas is now over in GTA Online, but the spirit of the season—blowing stuff up online—is carrying on thanks to some weapons from the future. The Unholy Hellbringer and Widowmaker guns, normally sported by Republican Space Rangers, can be yours, at least if you’re able to shell out for them next time you visit Ammu-Nation. These hefty alien-killers will set you back wee bit more than a rubbish handgun, though it’s probably just a drop in the ocean for you ultra-rich CEOs. Think of us down here, cutting corners and forgoing expensive dinners so we can afford the latest in future murder tech. The Widowmaker, for instance, costs $499,000, though you’ll never have to worry about ammo again, seeing as it’s infinite. You’ll also be able to earn double cash and RP rewards if you dive into the Arena War series, which now includes some additional competitive modes: Hasta La Vista, Vehicle Vendetta and The Vespucci Job. All Biker business sales are paying out double cash, too. The reward bonuses will continue through January 14. There are a bunch of discounts this week, as well, including 35 percent off Biker businesses, 30 percent off facilities and lots of cheaper vehicles. The full list list is below.